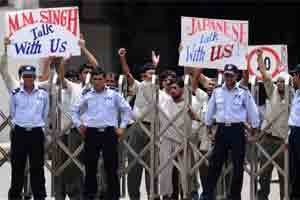 A file photo of agitators at the Maruti plant, now pacified. Gurgaon: The 14-day-long strike at Maruti’s Manesar plant, which is estimated to have cost the company over ₹ 700 crore, was called off Friday following a tripartite agreement between the management, workers and Haryana government. The agreement provides for reinstatement of 64 dismissed permanent workers by MSI, which will also take back 1,200 casual workers. However, 30 permanent workers will remain suspended. The Haryana government signed separate tripartite agreements with the management of Maruti Suzuki India (MSI), Suzuki Powertrain India Ltd (SPIL) and Suzuki Motorcycle India Pvt Ltd (SMIPL) and their respective workers’ bodies to end the strike involving about 3,000 employees. Stating that workers were quite happy with the agreement, she said the workers’ representatives who signed the settlement had already informed their colleagues about the modalities of the settlement. Ahlawat said the casual workers will be reinstated within the next 7-10 days. When contacted, a spokesperson of MSI said, “Yes, the issue has been resolved and normal operations will resume tomorrow." The company said in a statement that it “individually considered the cases of all employees against whom disciplinary action had been taken". “It evaluated the severity of indiscipline in each case. Wherever the charges were not serious, the management has decided to take back the employees. The agreement provides that 64 employees will be taken back," it said.